This study sought to evaluate the efficacy of a brief version of the Happy Classrooms Programme in psychological well-being, school aggression, and positive classroom climate. Likewise, this study also aimed to identify which intervention effects could be attributed to the development of mindfulness. Finally, the last target of this study was to evaluate the implementation fidelity and the acceptability of the programme. Multiple linear regression and longitudinal mediation analyses were performed with a sample of 524 students (49.8% boys and 50.2% girls) with a mean age of 13.6 years. Results provided evidence of the efficacy of the intervention in the majority of variables. For Mindfulness, Depressive Symptomatology, Perceived Stress, Competence, Emotional Attention, Identified Regulation, External Regulation, and Amotivation, the intervention proved efficacious only when pre-treatment levels of mindfulness were high, and sometimes also medium. For Self-esteem, Satisfaction with Life, Relatedness, Emotional Repair, Physical Aggression, Relational Aggression, Affiliation, and Teacher Support, intervention effects were irrespective of pre-treatment levels of mindfulness. 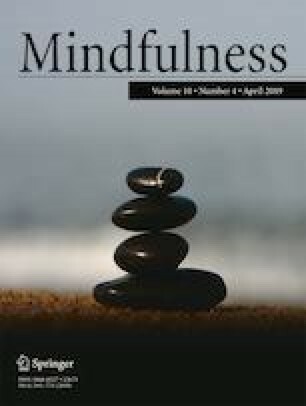 Mediation analyses found evidence of longitudinal mediation effect of mindfulness on the relation between the intervention and most outcome variables. Implementation data showed that total time implemented by the teachers varied among them and that the programme was not highly acceptable by most students. Our findings point out that Happy Classrooms Programme may promote psychological well-being and positive classroom climate, and reduce school aggression in students by increasing mindfulness levels. The online version of this article ( https://doi.org/10.1007/s12671-019-01132-8) contains supplementary material, which is available to authorized users. ASL: designed and executed the study, executed the data analyses, and wrote the paper. TIJ: designed and executed the study, and wrote the paper. RA: trained the teachers to implement the programme in their classroom. SH: trained the teachers to implement the programme in their classroom. SV: collaborated in the writing and editing of the manuscript. JM: designed and executed the study, and assisted with the data analyses. All authors approved the final version of the manuscript for submission and collaborated with the writing of the study. This research was partially supported by grants from the Fundacion Universitaria Antonio Gargallo and Obra Social Ibercaja (ref. 2013/B005; ref. 2014/B005) and Department of Industry and Innovation, Government of Aragon, Spain (ref. S114). Research was conducted in compliance with APA ethical standards. All procedures were in accordance with the ethical standards of the University of Zaragoza institutional review board. The manuscript does not contain clinical studies or patient data. Passive consent was obtained from participants’ parents or guardians. RA and SH are co-founders of the Happy Classrooms Programme. Arguís, R., Bolsas, A. P., Hernández, S., & Salvador, M. M. (2012). Programa “Aulas Felices”. Psicología Positiva aplicada a la Educación. Resource document. http://www.aulasfelices.org. Accessed 5 Mars 2018. Seligman, M. E. P., & Adler, A. (2018). Positive education. In The Global Happiness Council (Ed. ), Global Happiness Policy Report 2018 (pp. 53–73). New York: Sustainable Development Solutions Network. Retrieved March 3, 2019 from https://www.researchgate.net/profile/Alejandro_Adler/publication/323399593_Positive_Education_Seligman_M_E_P_Adler_A_2018_Positive__73_Global_Happiness_Council/links/5a94362045851535bcdaaa61/Positive-Education-Seligman-M-E-P-Adler-A-2018-Positive-Education-In-J-F-Helliwell-R-Layard-J-Sachs-Eds-Global-Happiness-Policy-Report-2018-Pp-52-73-Global-Happiness-Council.pdf.